Fellowship Previews: Valiant Announces NINJAK: THE COMPLETE CLASSIC OMNIBUS OVERSIZED HC – On Sale in November! Valiant is proud to announce NINJAK: THE COMPLETE CLASSIC OMNIBUS OVERSIZED HC – an 800+ page oversized hardcover compendium collecting the groundbreaking debut and complete adventures of the Valiant Universe’s master super-spy in November! From his deadly debut in the pages of BLOODSHOT in 1993 all the way to the final mission of his best-selling solo series, the complete classic adventures of Valiant’s deadly secret agent have finally been collected between two covers for the first time anywhere! - Over 30 full-color issues, including Ninjak’s landmark first appearances from BLOODSHOT (1993) #6–7, his complete solo series run from NINJAK (1994) #1–26, #0 and #00, NINJAK YEARBOOK 1994 #1, and SECRET WEAPONS (1993) #5 – collected together in one volume for the first time anywhere! - Over 20 pages of bonus content, including rarely seen artwork and extras! - A stunning cover by comics legend Joe Quesada, fully remastered by Paul Mounts (The Ultimates)! - An oversized, deluxe hardcover presentation! In the proud footsteps of ARCHER & ARMSTRONG: THE COMPLETE CLASSIC OMNIBUS, QUANTUM AND WOODY: THE COMPLETE CLASSIC OMNIBUS, and X-O MANOWAR: THE COMPLETE CLASSIC OMNIBUS VOL. 1, Valiant’s library of oversized classic collections grows with this steel-shattering compendium chronicling the original origin and adventures of Colin King, aka the deadly Ninjak! This November, find out where the legend of one of Valiant’s greatest icons began with a shelf-busting hardcover collection of his most dangerous missions and black ops assignments, only in NINJAK: THE COMPLETE CLASSIC OMNIBUS OVERSIZED HC! 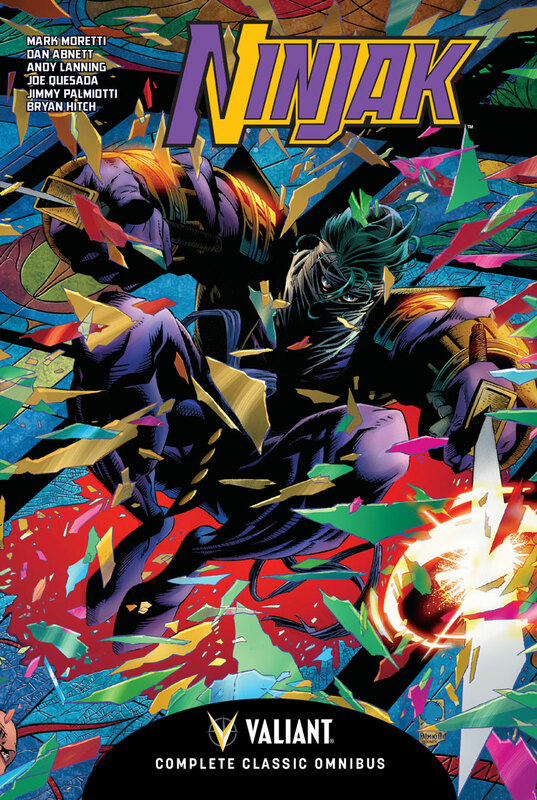 PLUS: Ninjak strikes again this November with a deadly new beginning in NINJA-K #1 – A NEW CAN’T-MISS ONGOING SERIES! Coming this fall from renowned writer Christos Gage (Netflix's Daredevil) and superstar artist Tomas Giorello (X-O MANOWAR), the United Kingdom’s most dreaded intelligence operative delves into the cold, calculating world of espionage and international intrigue! Colin King’s next mission begins in NINJA-K #1 – coming this November from razor-sharp creators Christos Gage and Tomas Giorello and featuring covers by Trevor Hairsine (DIVINITY), rising star Lucas Troya, Kenneth Rocafort (The Ultimates), David Mack (Kabuki), and Mico Suayan(BLOODSHOT SALVATION)!